For more than 60 years the Weybridge Society has campaigned on behalf of Weybridge residents to ensure that the town and surrounding areas remain beautiful and peaceful. We’ve worked hard to preserve the heritage of the town and always make sure that proposed changes try to keep the town’s character for buildings and streets. We’ve been involved in a variety of projects – from building works to traffic and parking and pedestrian schemes – working both by ourselves and with partners. We’ve instigated and also joined in at the behest of individual residents and smaller associations when the town’s character is threatened and when residents face particular issues as a result of new developments. See what we’re working on now and the major developments that we’re tracking at the moment, as well as other important local issues, in Current Activities. We’ve also been involved in numerous smaller but still significant developments which include alterations and new building works for care homes, schools, flats and gated estates. Preserved the Victorian lamp posts in central Weybridge, which date from 1895. Did you know Weybridge was the first town in England to be lit wholly by electricity? Weybridge parking review – a current massive study of the way business employees and residents use local roads. We’re working with Surrey County Council to see how we can improve parking in two key areas of town: Queens Road and High Street. HGV campaign – we worked to stop HGVs coming through Weybridge from the Brooklands industrial area, and we’re about to tackle this issue again! As a town defined by its rivers and canals, Weybridge wouldn’t be the same without the various riverside areas where residents go to relax. Therefore we take a keen interest in what goes on bankside and schemes that affect river use. The Weybridge Society has been instrumental in looking after the riverside by supporting the Thames Gate-Wey Scheme. 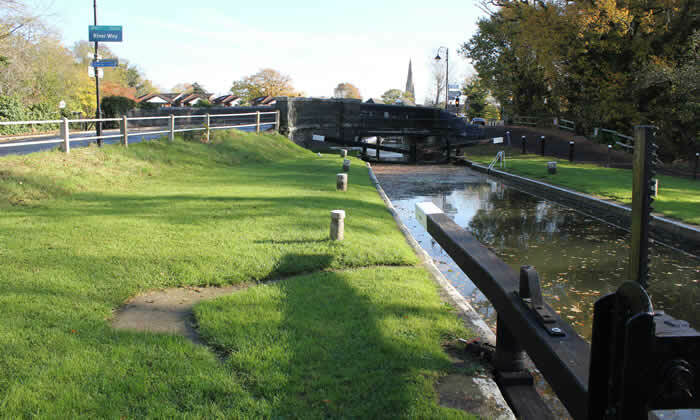 Together with Elmbridge Borough Council, the Environment Agency and the Thames Landscape Strategy, the Society has worked on the Thames Gate-Wey Scheme, resulting in an improved picnic area, towpath, mooring and views, and renovation of the car park at the end of Thames Street. Critically we commented on and campaigned for the new Walton Bridge and its surrounding areas, including public footpaths, and we supported the 350 anniversary celebrations for River Wey Navigation. Do you have a special interest in the riverside area? Would you like to help keep it clean and resident friendly? Join Us as we look to expand our work on the environment and river areas.